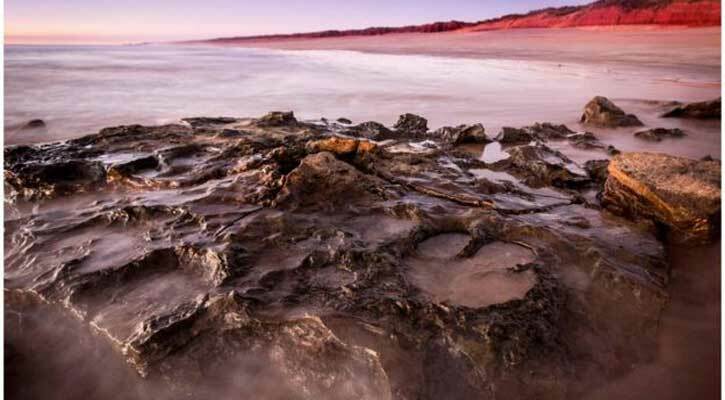 Risingbd Desk: Scientists have described a remarkable collection of dinosaur tracks on beaches on the Dampier Peninsula, Western Australia. More than 20 different types of fossil footmarks have been captured in sandstone rock. Some are over 1.5m in size, recording the movement of sauropods - the giant beasts with long necks and tails. The trackways, many only visible at low tide, were "globally unparalleled”, claimed the lead scientist involved. "It is extremely significant, forming the primary record of non-avian dinosaurs in the western half of the continent and providing the only glimpse of Australia's dinosaur fauna during the first half of the Early Cretaceous Period," Steve Salisbury said in a statement. "It's such a magical place - Australia's own Jurassic Park, in a spectacular wilderness setting." Dr Salisbury said some of the tracks were left by stegosaurs - the creatures that sported bony plates along their backs. This is the only evidence of their presence in Australia. The researcher put together a team from Queensland University and James Cook University to investigate the footprints after being invited to do so by area's Goolarabooloo Traditional Custodians. Aboriginal people have long referred to the markings in their oral history. Dr Salisbury's team spent more than 400 hours detailing the prints between 2011 to 2016. Thousands of tracks are recorded at 48 discrete sites centred on Walmadany (James Price Point). The scientists examined and measured the depressions using three-dimensional photogrammetry, which builds accurate models of the subjects under investigation by taking pictures from various angles. The beaches' sandstones are between 127 and 140 million years old. "There are thousands of tracks around Walmadany. Of these, 150 can confidently be assigned to 21 specific track types, representing four main groups of dinosaurs," Dr Salisbury said. "There are also some of the largest dinosaur tracks ever recorded. Some of the sauropod tracks are around 1.7m long. "Most of Australia's dinosaur fossils come from the eastern side of the continent, and are between 115 and 90 million years old."